This article will explain the process to link more than one Atlas game server together so you can complete the Atlas map. If you don&apos;t already have any Atlas game servers, you can rent them here. 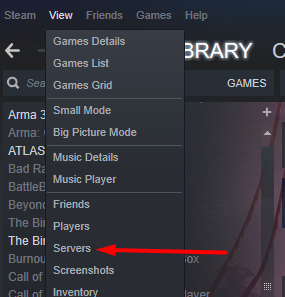 You must have more than one Atlas game server with us, they should all be on the same dedicated server so we may need to transfer them if not. There are ways that may work to make it work when they are on different machines, but this is untested / unofficial, so we advise keeping them all on the same machine, but we are happy to test with your game server should you wish, just contact us. This applies to the default 4x4 map we have setup, if you are using a custom map, the steps will be relatively the same, but may differ on some parts. All servers must be running the same Atlas version! If an update has been released, you must update them all. This may seem complex, but its not so bad. Follow the steps precisely and you should be fine setting it up to link perfectly. We do offer a setup service should you wish us to do it for you for $7, just contact us. Pick one of your Atlas servers with us to be your master. If you&apos;ve played on any of your Atlas servers, it should be one of those you&apos;ve already played on, if you got multiple straight away, you can pick any. Delete the entire contents of the file. Do ctrl + v, or right click > Paste, to paste the entire contents you copied in step 2, into the file. 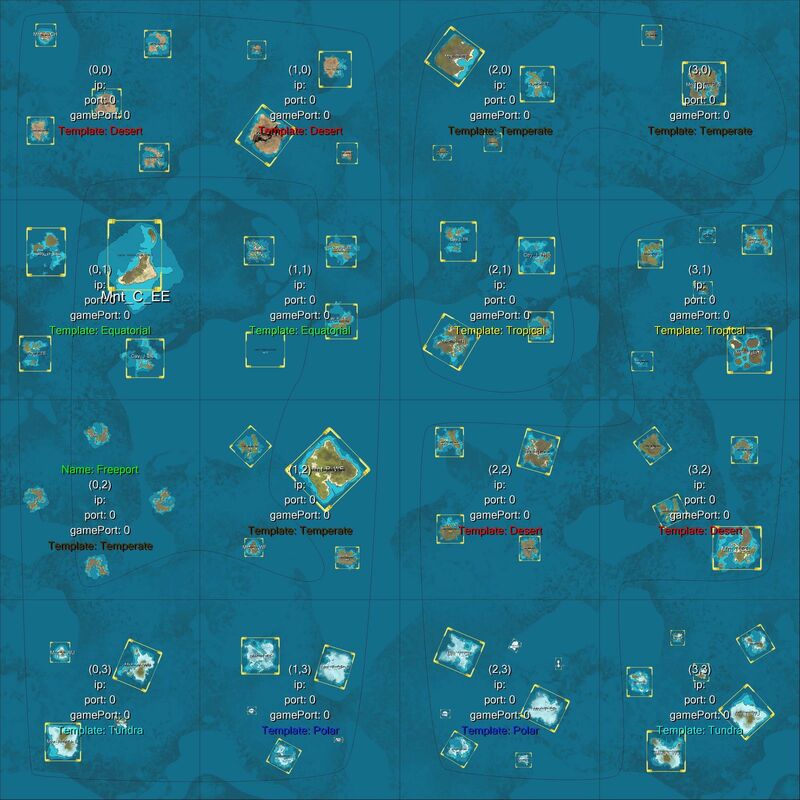 This image shows the default 4x4 map, each square represents one server. So for example a good setup would be: you have the master server on 0,2 , then additional servers on 0,3, 0,1 and 0,0. Then when you go north or south from the Freeport (home server) you&apos;ll move into the other servers and areas of the map. This gives you a server on each of the environments; Tundra, Temperate, Equatorial and Desert. So now you know the map, back in the ServerGrid.json, you&apos;ll see at the parts of the code that shows gridX and gridY this shows the start of the server details that will control that area of the map. Set for each grid area, the ip `port` gamePort `seamlessDataPort` values for the server you want to control that area. Click the "Show Important Info" button on each game server in your control panel to show what those are for each each server. Once you&apos;ve set the values for the servers you have for the areas of the map you want, click save. You can set up to 16 servers on this one 4x4 map, you can have even more with a custom map. You don&apos;t need 16 servers though, you can have just one, 2 or three etc and only enter the details for the areas you want to use, and expand whenever you wish. Now, copy the entire contents of this file. Paste the entire contents that you copied at the end of step 4. On the master server that you chose in step 1, click the "Start/Stop Database" button, make sure it shows that the server has started. If it says its stopped, just click it again to start it. - Set a description at the top. Click Select IMPORTANT Many people forget this step, you must select your newly created command line! 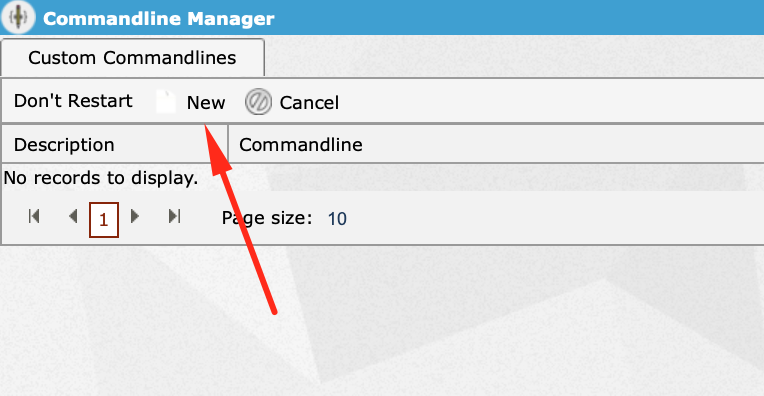 You can now start all your servers, and if done correctly will all be perfectly linked up! Click "Add this address to favourites"
You will then see your server and you can select it and click Connect. We recommend opening Atlas before clicking join. Some servers are stuck around 350MB RAM. Shut down one server, and tried to join another, but i cant. Turn the server that you shut down back on again, and move your character to another server. If you no longer have that server, you will have to wipe your database and start over. This will delete all players, there is no currently known way to remove your character data from the database without a full wipe. To wipe the database; stop all servers and stop the click the "Wipe Redis Database" button on your master server. If you have any issues, we&apos;re here to help, contact us.